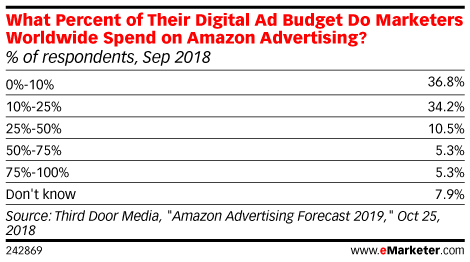 Data is from the October 2018 Third Door Media "Amazon Advertising Forecast 2019." 681 marketers in the US (61%), Canada (5%) and worldwide (34%) were surveyed online via Third Door Media's websites, Marketing Land, Search Engine Land and MarTech Today, and related social channels, in August and September 2018. Respondents identified their company's revenues as under $10 million (52.2%), $10 million-$25 million (15.6%), $25 million-$100 million (15.6%) and greater than $100 million (16.6%). Respondents identified their job function as account specialist (12.8%), agency director/VP (5.0%), agency manager/professional (8.7%), analytics director/VP (0.2%), analytics manager/professional (3.0%), CIO/CTO/COO/CXO (1.1%), CMO (2.7%), ecommerce director/VP (3.2%), ecommerce manager/professional (4.3%), executive management/CEO/CFO/president (3.0%), marketing director/VP (10.0%), marketing manager/professional (24.6%), marketing technologist (5.5%), owner/partner (6.8%), sales/business development (4.3%), senior management/GM/VP (2.5%), technology director/VP (0.7%) and technology manager/professional (1.6%).